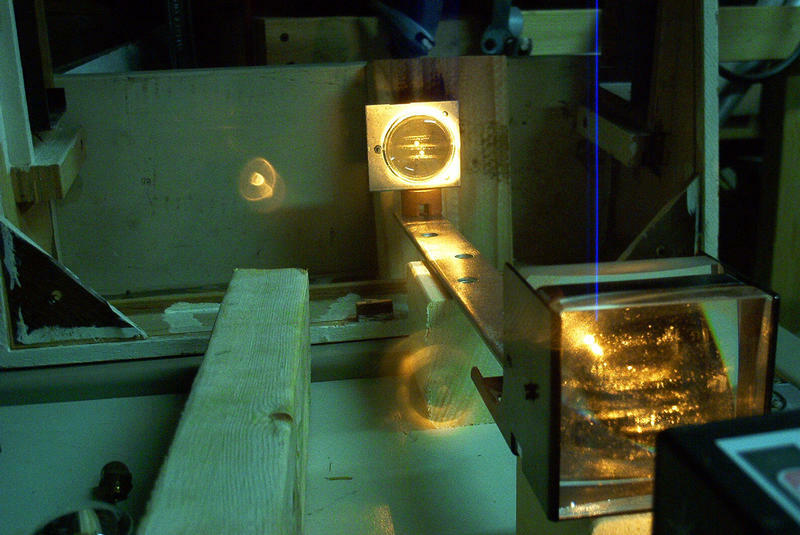 Today Chris and I conducted our first test firing of our 100 Watt Diode Laser. It was a complete sucess! Since the laser was meant to feed directly into a fibre optic cable for delivery, without the fibre, the beam is very diverse. It spreads out from the head at about a 20 degree angle. It's hot enough however that a piece of paper held an inch away from the head will burn. We rigged together a focusing system using a few spare lenses, and were able to get wood blocks to burn and char quite a bit. On the very first try, we got a beam out of the first head. As you can see, the laser is actually several lasers, in three rows, we figure about 100. Each, of modest power, but when focused together, give 100 watts. The second head seems to be old, or otherwise damaged. It had a much lower output. The focusing setup. We need some cleaner optics, and a better mounting system, but for what it was, it worked fairly well! Click Here to view the first 7 comments to this article! Photon Bender (2003-12-11): I was surprised when Laser Jock showed me this site. I am the person who was responsible for building this system. I think that there were originally 10 heads made and maybe 4 or 5 diode driver / cooler systems. The systems were intended for Photo Dynamic Therapy experiments being done at UCI. 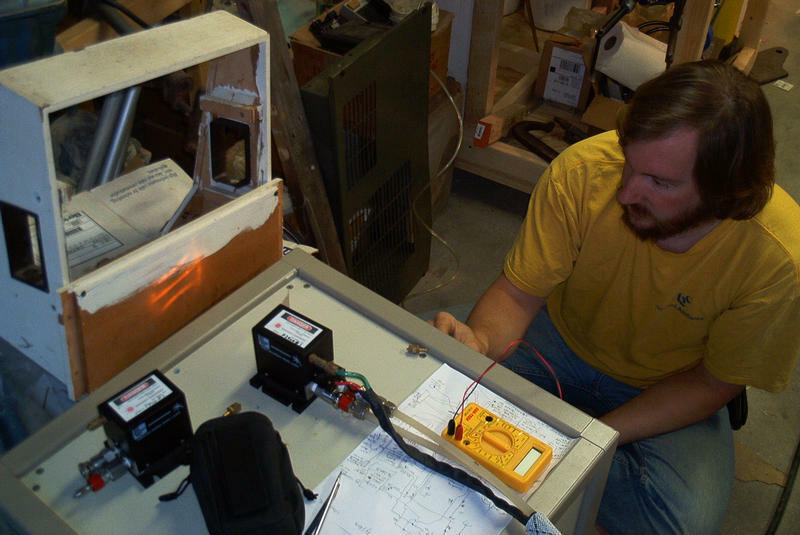 The label on the head is misleading; it is not a 100-Watt laser, for safety reasons the label rating exceeds the actual output. The highest output any of these heads achieved was about 20 Watts although that was out of a fiber (I would have to look up the coupling efficiency, probably around 50%) therefore the max output was probably 40 Watts. From what I recall the diodes output decayed after a short time (a year or so) and there were some diode failures. Judging by your photo it looks like there are only 3 out of 5 diodes operational, I do recall having to replace some diodes with spacers when the diode supply ran out. Erik (2003-12-11): Wow! How interesting it is to meet the person who built this thing! You say there were only 5 diodes in each head? Why does the beam output look like a hundred or so small rectangles? We assumed each of those were one diode. Photon Bender (2003-12-13): There are 5 diode bars in each head. Each bar is segmented into hundreds of emitters, the emitters are isolated from each other. So the gaps you are seeing is the isolation zones. You don't have to tell me but out of curiosity how much did you pay for the system? If you want to you can buy the fiber that attaches to the head, the fiber pigtails come pre assembled. 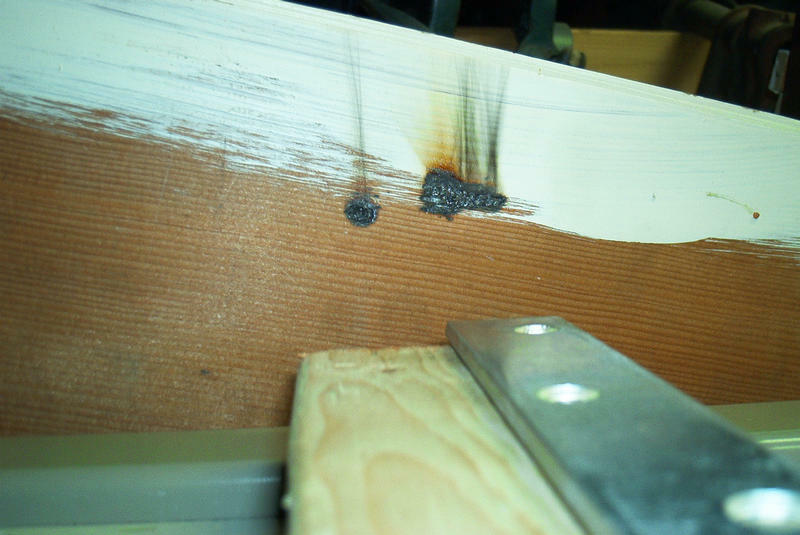 I can look up which fiber was used but I believe it was a 600 micron fiber (it takes a large diameter fiber). Erik (2003-12-13): I see. Interesting. If I remember correctly, we paid $300 for the power supply/cooling unit, and the two heads. We bought it just for fun, and it is. Thanks for building it for us! Photon Bender (2003-12-13): $300, you did pretty damn good. The chiller alone is worth more than that. Congratulations and have fun. MAR (2011-02-07): Hi. A friend and I looking to build a laser cutter able to cut plastic, and I was wondering if there was any advice, manufacturers, or websites that you could recommend. You obviously know what you are doing and any tips you can give us would be much appreciated! Erik (2011-02-13): MAR, I don't know where to send you, except maybe projects related to the makerbot. jake (2011-10-21): im working on a science project... we need to know at what level wattage can a laser go through human skin? Erik (2011-10-24): Hi Jake, I don't know exactly what you're trying to do, but anything above 1 milliwatt can cause immediate blindness. The above 30 watt red frequency laser could do serious burning damage to human skin, about as much as a large Fresnel lens and sunlight. Erik (2011-10-24): Jake, practicality of such a weapon aside, you'd need thousands of watts, maybe millions to accomplish such a burn. Laser weapons are much more suited for sensitive and easily de-stabilized targets, like ICBMs, which is what the military is currently developing laser weapons for. braiden (2011-10-24): how much heat does it take to light a match???? Photon Bender (2011-10-24): hey Erik. i was just looking at your co2 powered cannon. how much did it cost to make? 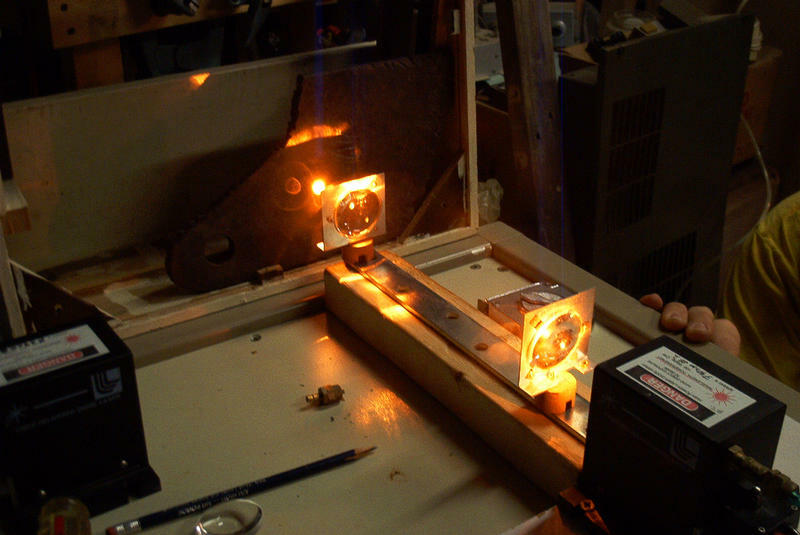 Erik (2011-10-24): Jake, a 1-watt laser will take a loooong time to melt its way though ballistic jell. For depth, I'd measure your own torso. 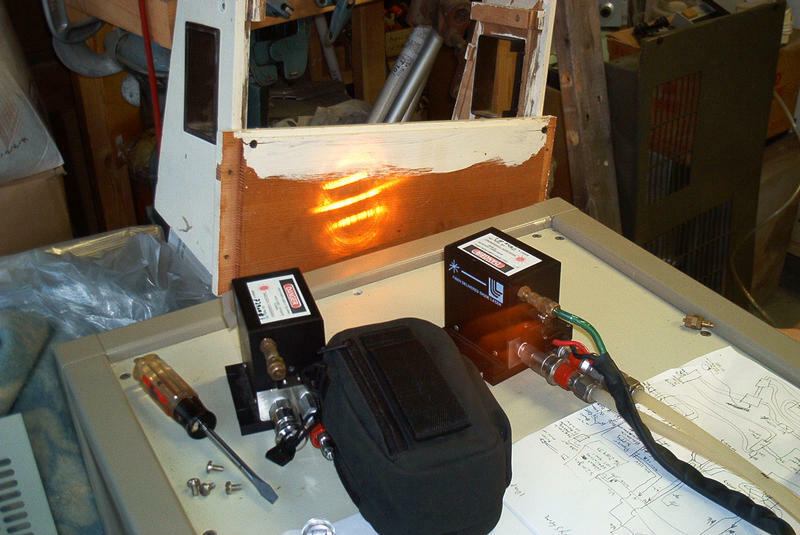 Photon Bender, the CO2 laser was bought from a salvage yard. New, it would cost several thousand dollars.